Franks Great Outdoors was founded in 1945 by Frank and Margaret Gorske. Franks Great Outdoors was originally named Franks Bait and Tackle and was a small bait shop selling live bait and a small amount of tackle until its expansion in 1973. Today Franks still sells live bait, the reason it opens so early in the morning, including before 6 a.m. on Saturday. 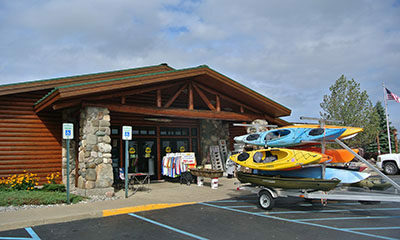 The sprawling store also can carries kayaks, canoes and features an extensive camping department as well as hiking and backpacking equipment. Frank's Great Outdoors was founded in 1945 by Frank and Margaret Gorske. Frank's Great Outdoors was originally named "Frank's Bait and Tackle" and was a small bait shop selling live bait and a small amount of tackle until its expansion in 1973. Today Frank's still sells live bait, the reason it opens so early in the morning, including before 6 a.m. on Saturday. The sprawling store also can carries kayaks, canoes and features an extensive camping department as well as hiking and backpacking equipment. Monday-Thursday: 6 a.m. - 8 p.m.
Saturday: 5:30 a.m. - 7 p.m.
Sunday: 6 a.m. - 6 p.m.